Fresh spinach enjoys a high water content. 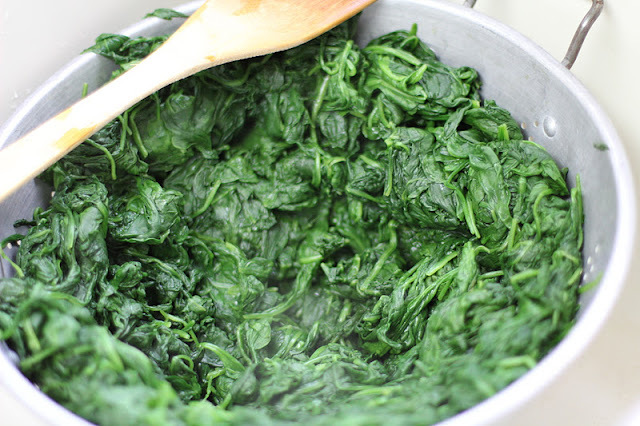 To prevent spinach from diluting a cheese sauce, or flooding a Greek pizza, spinach must be "dehydrated" before using. The process for wilting spinach is easy; it is the final pressing, or squeezing, that takes most of the effort. 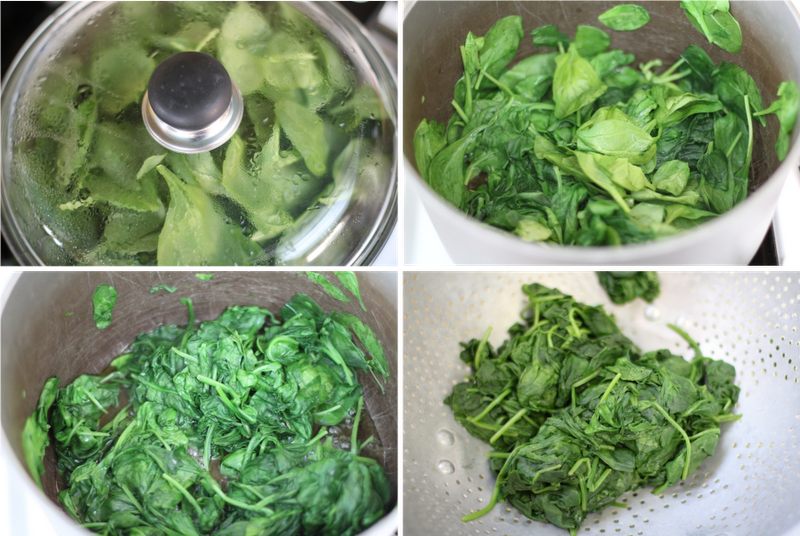 You can save the cooking step (in the recipe below) if you choose to use frozen spinach that has been defrosted. However, you will still need to squeeze the heck out of the spinach to remove all the excess water. 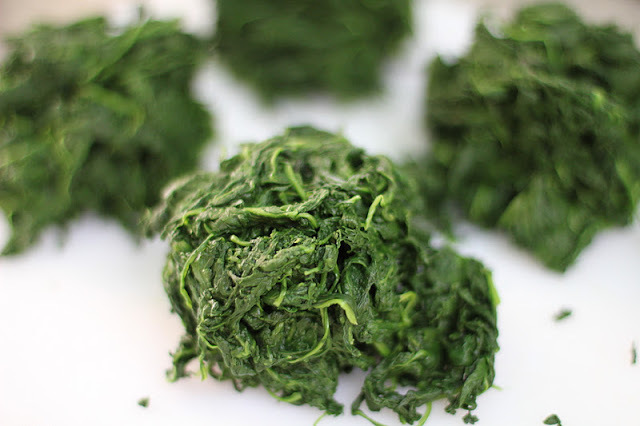 1 pound pound spinach leaves = 1 cup wilted spinach (loosely packed, about 5-ounces). I typically purchase prewashed baby spinach available in a bag. 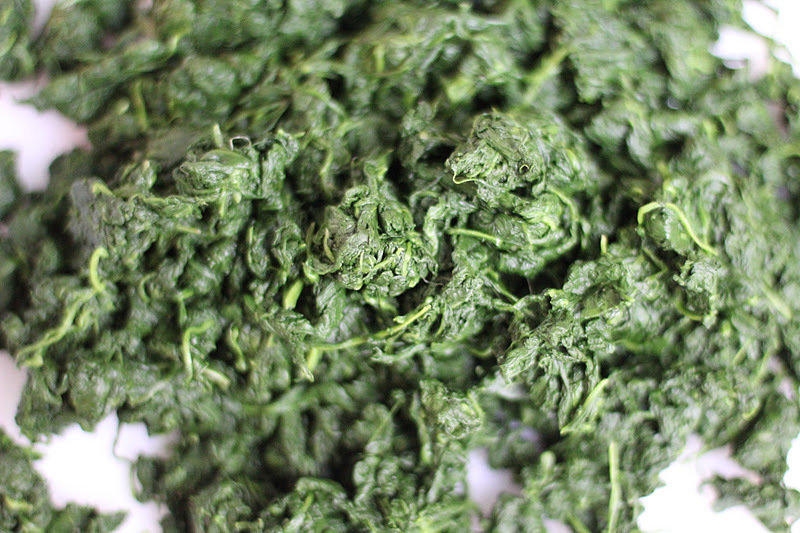 If you buy a "bouquet" of spinach, you will need to thoroughly wash the leaves and discard tough stems. There is no need to dry the spinach before cooking. 1. 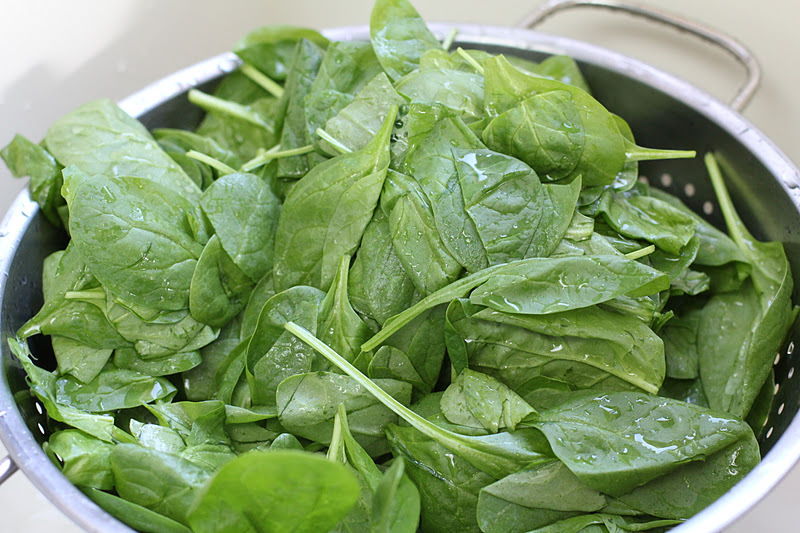 In a large colander, rinse the prepackaged baby spinach leaves. The leaves need the spritz of water to reduce properly in the pan. If you are using spinach that has not been prewashed, take some care with the cleaning. Dirt likes to hide in the crevises of the leaves, so give a good rinse under running water. You may want to let the leaves soak in a bowl of water and then gently agitate. You can lift the leaves from the water, leaving the dirt and debris to sink to the bottom of the bowl. Change the water between batches of leaves. 2. Place the wet spinach leaves into a larg, deep heavy-bottom pot and fill to the brim with leaves. Cover with the lid and turn the heat to medium high. You will soon see condensation on the lid created from steam. As the spinach begins to condense, remove the lid and give the leaves a stir, every 30 seconds or so, until the leaves are completely wilted, about 2 minutes. Transfer the leaves to a colander, and let drain. Repeat as many times as needed for the amount of spinach required for your recipe. 3. When the spinach is cool enough to handle, you will need to remove as much water from the leaves as possible. I typically just squeeze handfuls with my fingers to remove the water, but using cheesecloth is better for processing larger batches, such as when I wilt 5 pounds of spinach for my Chicken and Spinach Manicotti. 4. 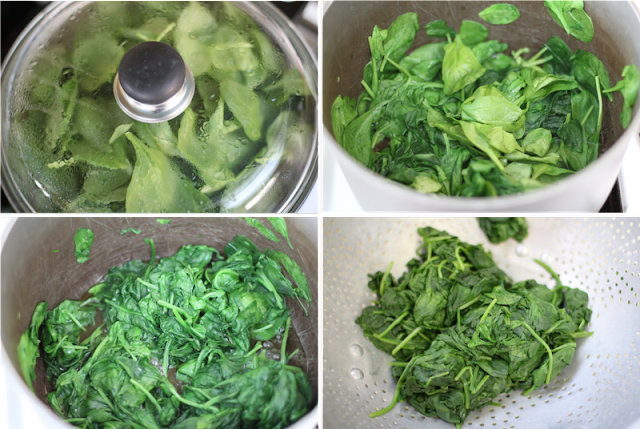 Once you have removed the excess water from the spinach, you will have bundles of spinach. With your fingers, gently pull the bundles apart. If needed, with a chef's knife, chop through the pile of separated spinach a couple of times. 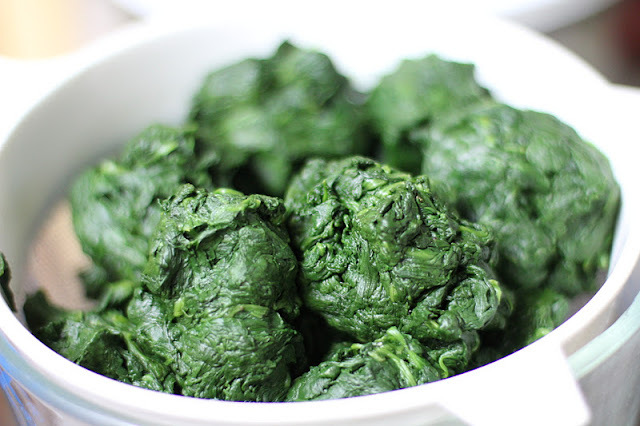 The spinach is now ready to use in recipes, such as Greek Pizza, Creamed Spinach, or sauteed in olive oil with some diced shallots, minced garlic and a little salt and pepper and maybe a few chili flakes tossed in for a little kick.